Barcelona beat host Real Sociedad 2-1 at the Anoeta Stadium on Saturday (15/9), in a follow-up to the Spanish League. Real Sociedad had already surprised Barcelona when the game entered the 12th minute. Starting from a free kick, the ball that slid into the penalty box was headed by Hector Moreno towards Aritz Elustundo. Sociedad central defender then fired a left-footed volley that slid heavily into Barcelona’s goal. The match in the first round runs minimal opportunities for both teams. Barcelona were not even able to score in the first 45 minutes. The visitors actually had many chances in the first half, one of them through Lionel Messi in the 26th minute. But the effort from La Pulga did not meet the target. At the start of the second half Barcelona immediately attacked Sociedad in order to equalize. But luck doesn’t seem to have approached Ernesto Valverde’s team at the beginning of the second half. Gerard Pique also tried his luck in the 36th minute. Unfortunately, the former Manchester United player’s header was unable to thrill Sociedad’s goal. The first half ended with a score of 1-0 for Sociedad. The wait for defending La Liga champions to break into Sociedad’s goal ended in the 63rd minute. Barcelona striker Luis Suarez successfully equalized using the chaos in front of Sociedad goal. Two minutes later Philippe Coutinho’s turn gave the danger signal to the hosts. But Sociedad goal is still safe thanks to the rescue of goalkeeper Geronimo Rulli. Barcelona were finally able to reverse the position to lead 2-1 thanks to Ousmane Dembele in the 66th minute. 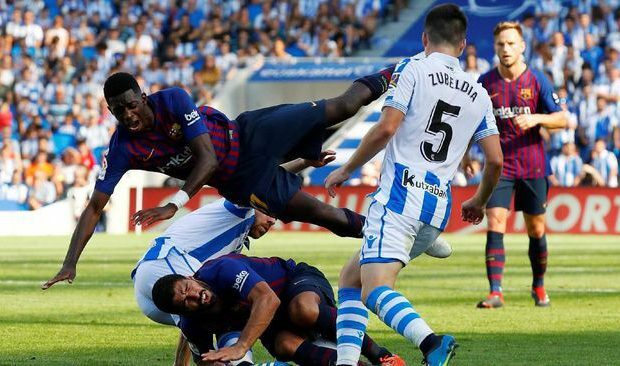 Dembele’s goal began with a wild ball in front of the Sociedad penalty box which was immediately struck by the left foot kick of the former Borussia Dortmund player. Barcelona superstar Lionel Messi had tried to score in the 79th minute, but he was still unable to thrill the Sociedad goalkeeper. Without any more goals created, the match ended with a score of 2-1 for Bacelona’s victory. This result make Barcelona remain at the top of the standings. Ernesto Valverde’s squad has 12 points from four matches. While Sociedad remained ranked 9th with 4 points. Barcelona striker Luis Suarez said his team’s narrow victory over Sociedad was proof of how competitive the Spanish La Liga was. Suarez rate, every team has the potential to defeat anyone. “I think you have to watch a game like this to understand how tight La Liga is, Last year we also had to be left behind to win here and eight or nine years ago we could not win here. This is a victory that adds to our confidence,” Suarez said. Meanwhile, Barcelona’s left back, Jordi Alba, flattered Marc-Andre ter Stegen, who performed brilliantly under the crossbar of Blaugrana. In the match, several times the German goalkeeper made an important rescue. “Ter Stegen is perfect today, that’s why he is the best in the world. We always have difficulties here, but the three most important points we have achieved,” Alba said.